A dockside gantry crane lifts a container Tuesday from the MSC Shuba B, the largest vessel to ever call at the Port, and a harbinger of bigger container ships to come. 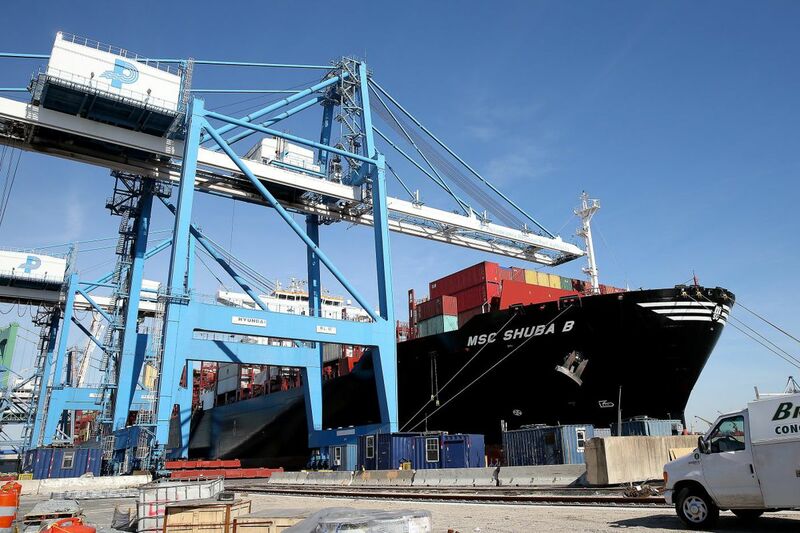 The Port of Philadelphia on Tuesday took measure of the largest container ship to ever dock at its wharves, the 1,083-foot-long MSC Shuba B, bearing a cargo primarily of South American produce. The ship, which was commissioned last year, is almost as long as a Nimitz-class aircraft carrier but is longer than the height of the Comcast Center (though a few feet shy of the new Comcast Technology Center). The operator lists the ship's capacity at 12,238 TEUs (20-foot-equivalent units, the standard size of international containers). Daniel Lazovich, Philadelphia marine operations and reefer manager for shipping company MSC, climbing onto the MSC Shuba B on Tuesday. It is part of a new generation of ultra-large container vessels sized to sail through the expanded Panama Canal, and a big reason why PhilaPort expects to set new records this year for cargo at its enlarged Packer Avenue Marine Terminal. "It's a sign of more good things to come," said Sean E. Mahoney, PhilaPort spokesman. The vessel, which was loaded in Chilean and Peruvian ports, took 10 days to sail from Callao, Peru, and was set to discharge a total of about 500 containers in Philadelphia, including 340 refrigerated boxes containing table grapes, nectarines, plums, pears, and the last part of the South American blueberry crop. A dockside gantry crane lifts a container from the MSC Shuba B, the largest ship to ever call at PhilaPort. The perishable produce will be quickly loaded onto trucks and distributed through the Northeast and Mid-Atlantic, and even into Canada. The ship will continue its voyage on to Northern Europe. The Port Authority is strengthening ship berths at the Packer Avenue Marine Terminal to accommodate next month's scheduled arrival of two new harbor cranes, which are tall enough and extend far enough to reach across the full width of such ships as the MSC Shuba B, which has a breadth of 158 feet. It won't be the first such vessel to call at Philadelphia. Mediterranean Shipping Co. (MSC) has weekly sailings of large vessels to transport produce from Peru to Philadelphia during the northern hemisphere's winter (when it is summer in South America). MSC commissioned the ship from owner Seaspan Corp. for 17 years, after which MSC takes ownership. It is part of a fleet of identical vessels built by Korean shipbuilder Hanjin Heavy Industries & Construction in the Philippines.